The Tiara Z frame is wider with a more decorative front edge, this will look more like a door architrave. A small 46mm deep frame with an overhang of 28.6mm, so great for covering wide gaps or uneven recesses. There is no deep/side fix option with this frame, just the one size which is 46mm deep. This means fixing is usually done through the light stop. 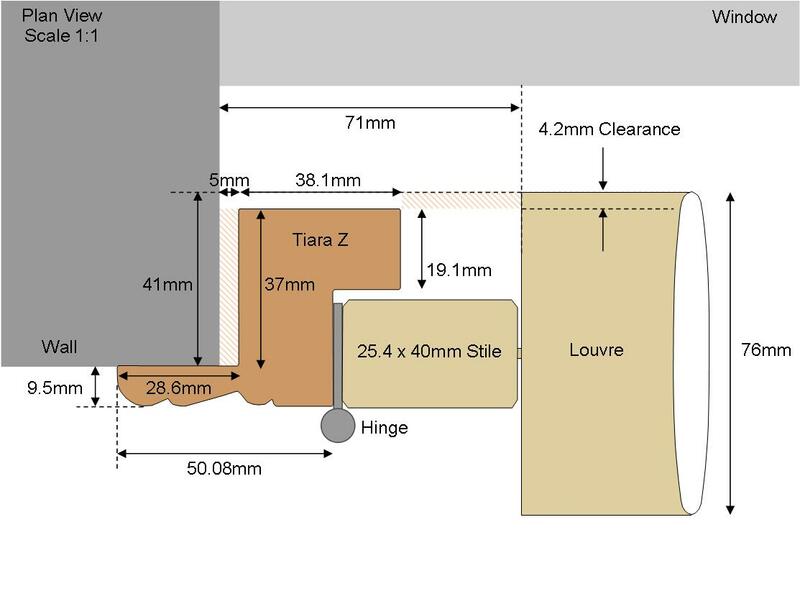 The Tiara Z frame will allow shutter panels to be folded back around the recess, it’s good for openings with shallow recesses and can be used for some inward opening style windows. If your window is out of square the Z part of the frame will cover any gaps, for really large gaps you would need to use the Crown Z as this has a much larger overhang. Remember, Z frames will make your room look smaller as they are fitted at the front of the recess so you lose the depth of your window sill. 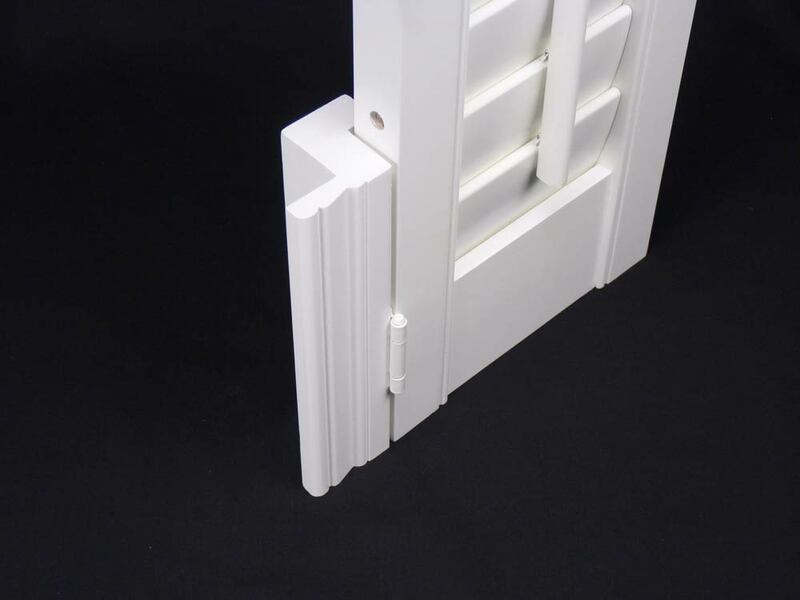 Our recommended way of installing shutters is the inside the recess using L frames. 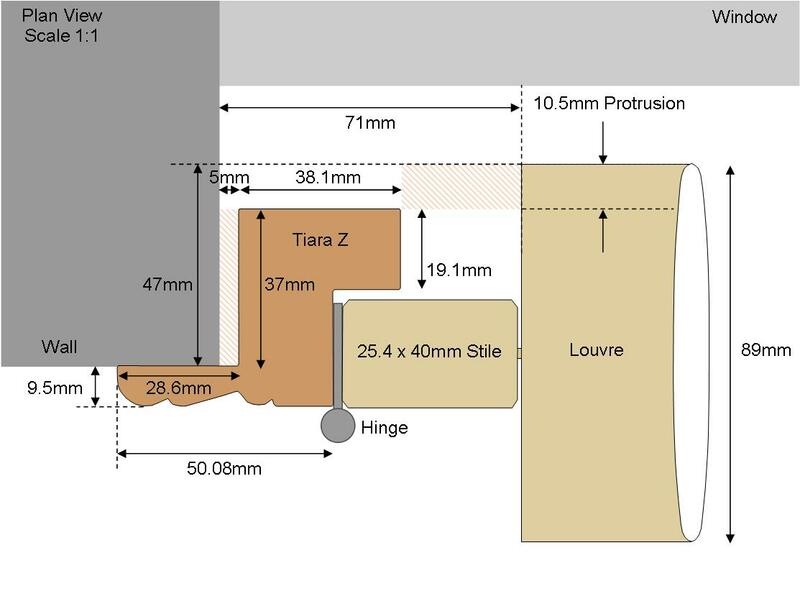 FIXING – Like the other Z frames, the Tiara Z can be fitted using D1 fixings. If you’re screwing the frame into the recess, just mind you don’t break out the wall as you will drilling very close to the front corner. SHADOW TAPE – Using shadow tape around the frame is an alternative way to stop light coming through the edges, this will save using filler or caulk and will make the frame much easier to remove if you need to. FRAME CLEARANCE – The deduction required will depend on the squareness of the window, remember there is a 1.6mm size tolerance when ordering frames, so you need at least 2mm clearance to ensure the frame fits within your recess. We would recommend deducting 4mm on square windows and 6mm on out of square windows, this deduction should be made from the smallest sizes.